Here’s the simple trick to Know If An Email Address Is Valid Or Not. If someone gave you a wrong email address, then you can check with this simple trick, whether the email exists or not. There are many different methods to know the person behind an email address. There are some tools available to do this. But with this method you can check within seconds whether the email is valid or not. You just need to open the Login page of email service provider and click on forgot the password. Enter the email and the message will be showing of whether the email is valid or not. You need to open login page of that email which you want to check. For ex. if the email’s service provider is google (mail) then you need to open mail.google.com. If the email service provider is google (The email is as [email protected]) then open mail.google.com and click on Need Help. And you can also open direct link google.com/accounts/recovery. Choose I don’t know my password and enter the email and Click on continue. If the email doesn’t exist, then it will show the message No account found with that email address. And if the email address is valid then it shows the name and profile pic of that person. If the email service provider is Microsoft (The email is as [email protected], [email protected], and [email protected]) then open outlook.com and click on Forgot my password. You can also open direct link account.live.com/ResetPassword. Choose I forgot my password and click Next. And enter the email address. If the email doesn’t exist, then it will show the message. If the Email service provider is yahoo (The email is as [email protected]) then open edit.yahoo.com/forgot or open mail.yahoo.com and click on Need help and choose I don’t remember my password. After that, enter the email address. 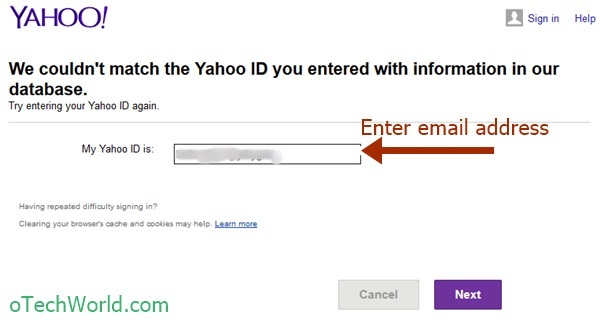 If the email is not valid then It will show the message We couldn’t match the Yahoo ID you entered with information in our database.